British Tars, 1740-1790: Repairing of Capt Cook's Ship in Endeavour River, 1770? 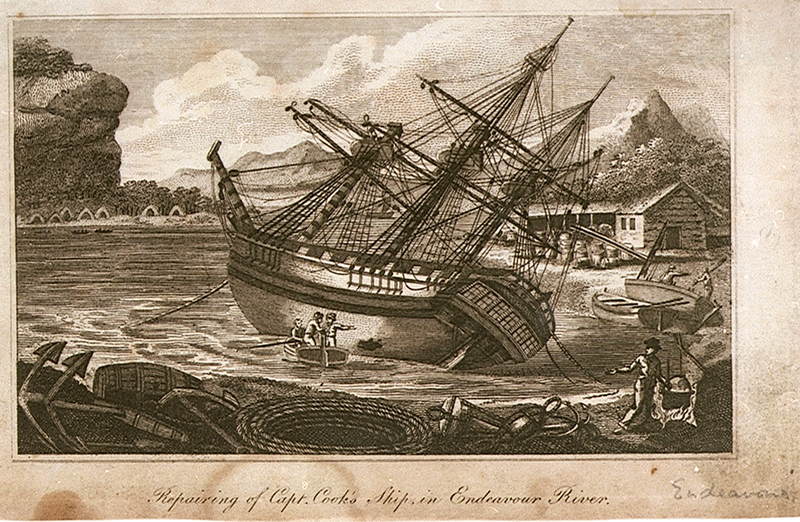 Repairing of Capt Cook's Ship in Endeavour River, 1770? "Repairing of Capt Cook's Ship in Endeavour River," artist unknown, date unknown, National Maritime Museum. The famous barque Endeavour was the trusty vessel that Captain James Cook commanded on his exploration expedition of 1769-1771. Captain Cook and his men faced numerous perils on their journey, and in this particular scene the Endeavour is being repaired after striking a reef off of Australia. Beside the shore where she was run up and repaired runs a river that now bears her name. This is the second time I have visited this storied shore. Unfortunately, this piece is low resolution, and doesn't yield much, but there is still something to e said of the sailors in it. At a pair of boats in the background, two sailors maneuver spars or oars. One, standing or sitting in the boat, wears a jockey style barge cap and jacket, with what appears to be the neckcloth hanging over his back. His mate wears a pair of trousers and a jacket. 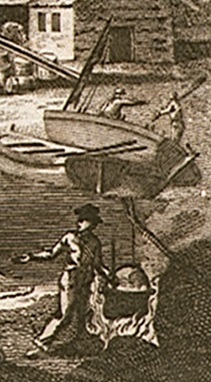 In the foreground, a sailor cooks over a large cauldron while wearing a round hat, single breasted jacket, and plain trousers. Inspecting the damage is a standing tar who wears a round hat, single breasted jacket, and what might be petticoat trousers or trousers. The cox wears the same, except he may be wearing breeches. And the oarsman is bare headed.